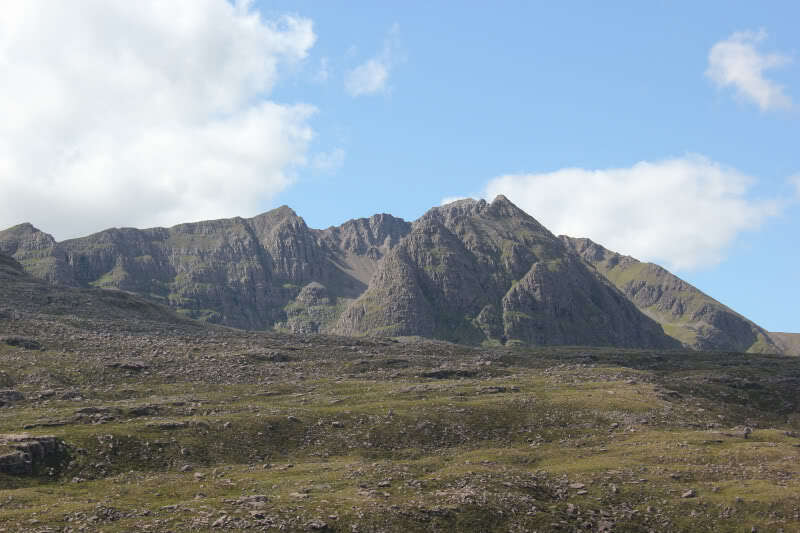 In 2005, with circa 20 Munros remaining, I set a date for my final Munro. 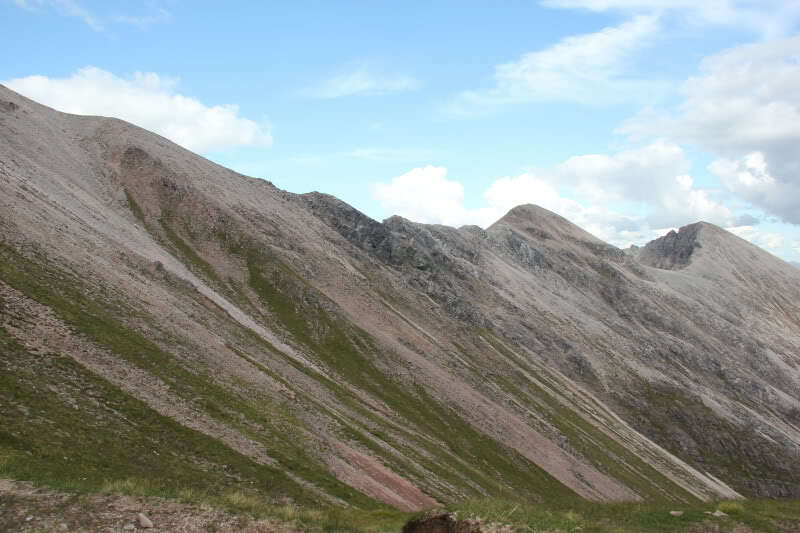 In hindsight, this was a really bad idea as it meant I had to rush my way through my remaining Munros, ascending them in all weathers. 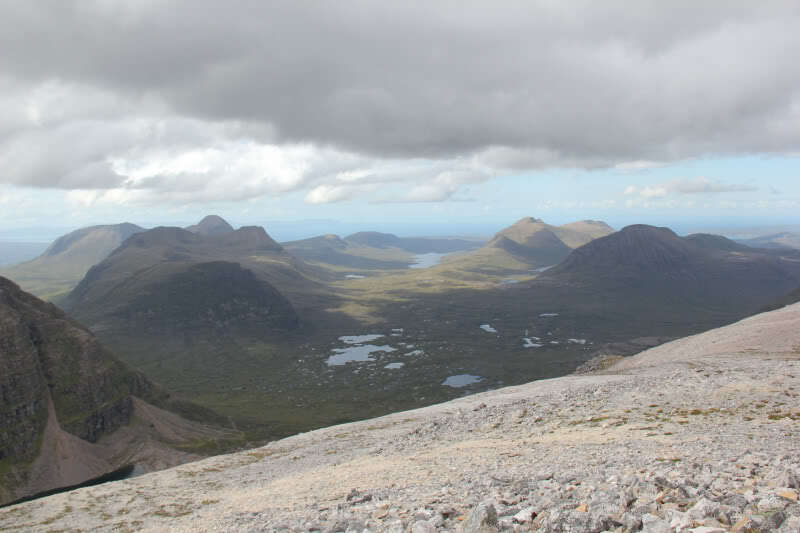 With less than a month to go until my final Munro, I set out to ascend Beinn Eighe in rain and thick mist. 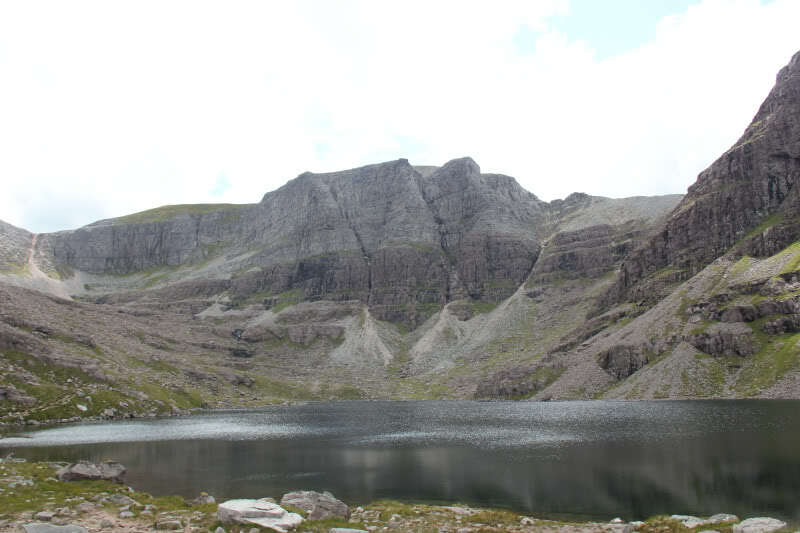 During the ascent I got no views of the triple buttress in Coire Mhic Fhearchair. 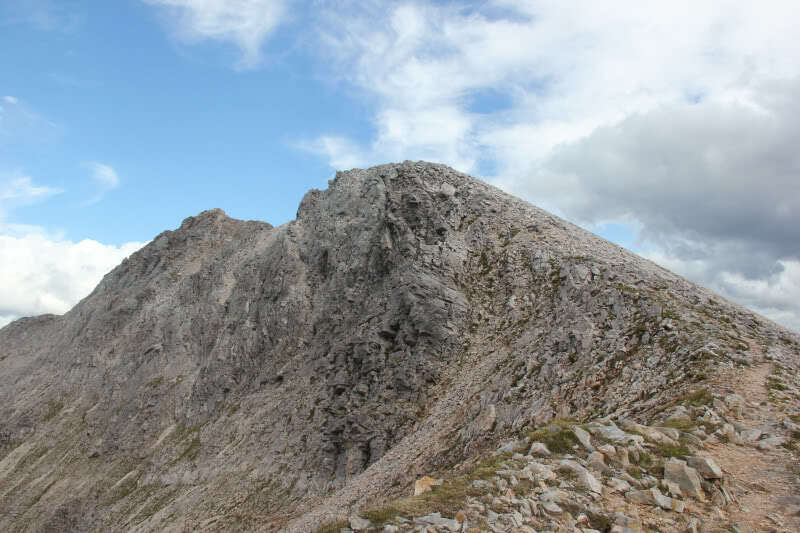 I therefore promised myself that I would definitely come back to re-ascend Beinn Eighe in good conditions. Seven years later, I fulfilled that promise . 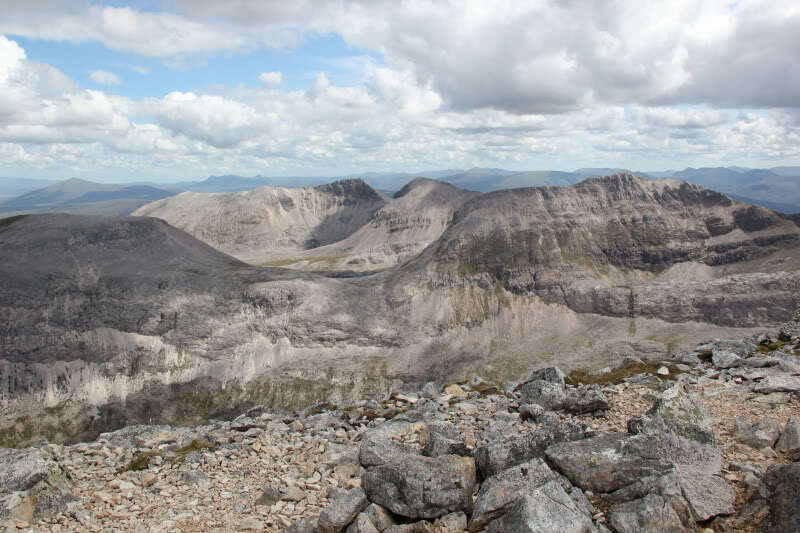 Beinn Eighe is arguably one of the most scenic mountains in Scotland. 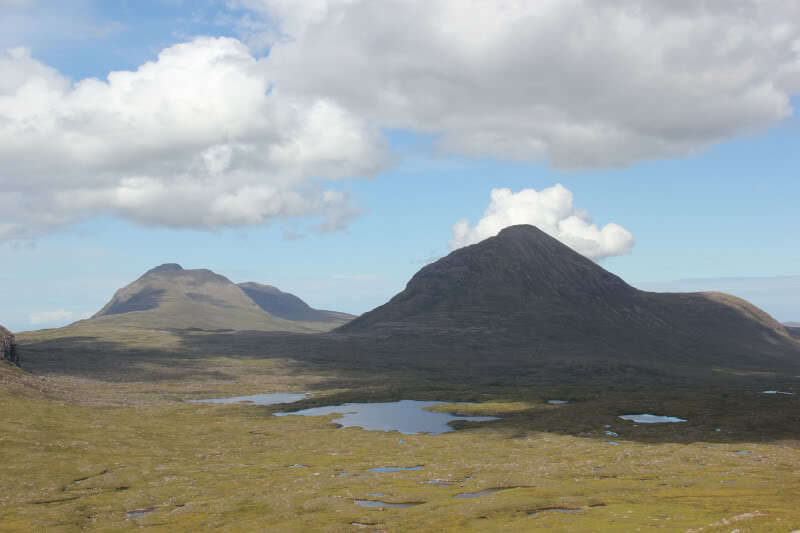 A vast expanse of a mountain consisting of two Munros, a Corbett (Ruadh-stac Beag) and numerous Munro Tops. 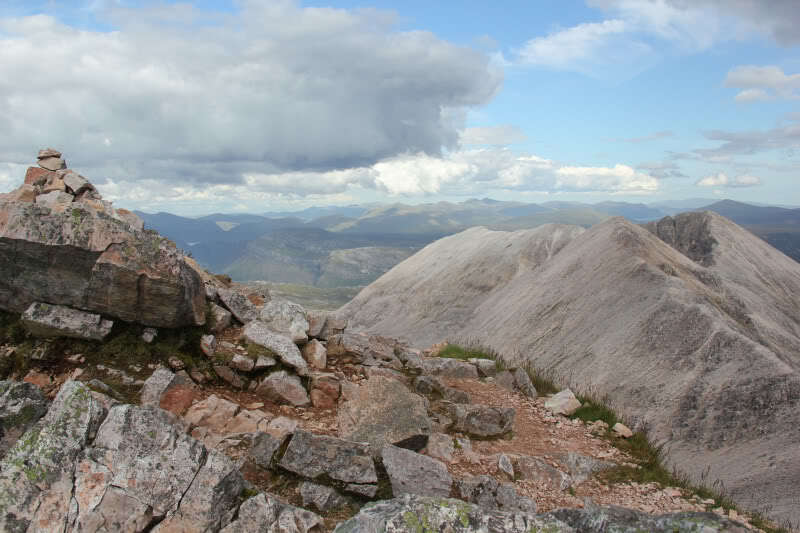 Yesterday morning, I set out with one of my original walking buddies to ascend Beinn Eighe. 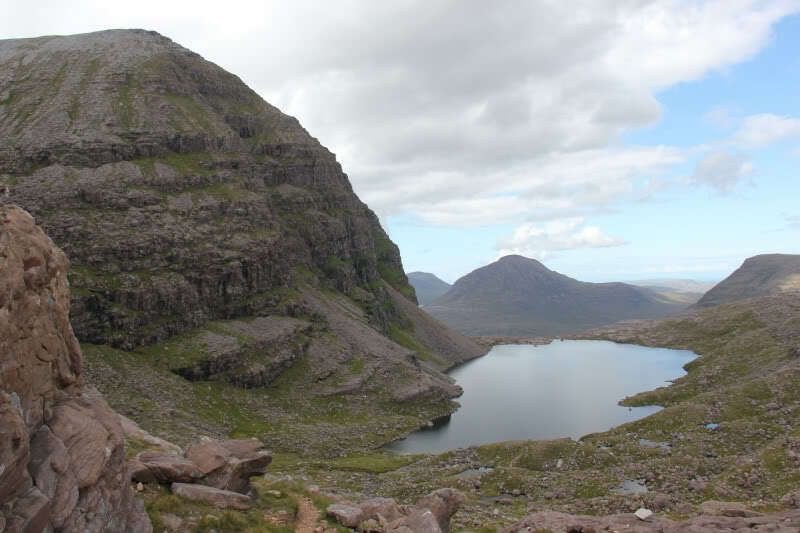 Unfortunately, Steve hurt his leg during the ascent up to Coire Mhic Fhearchair and therefore wisely turned-back, when it was all becoming a bit of a struggle. 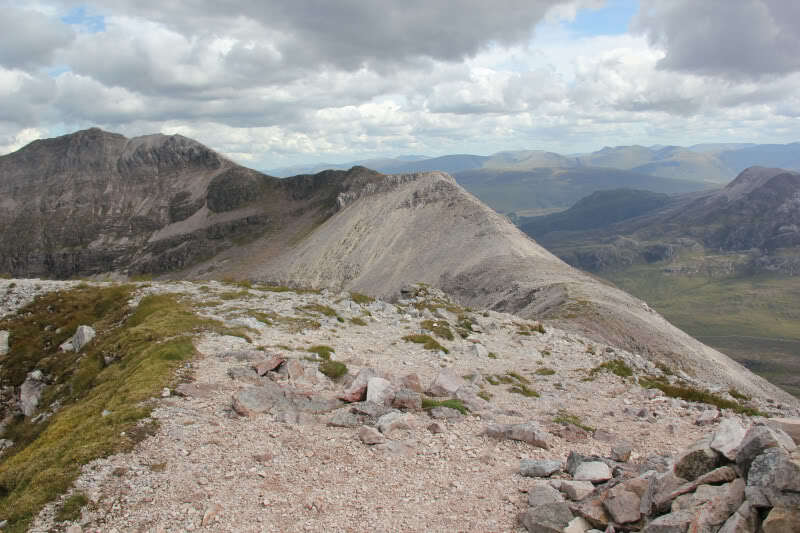 I carried on myself to summit the two Munros of Beinn Eighe. 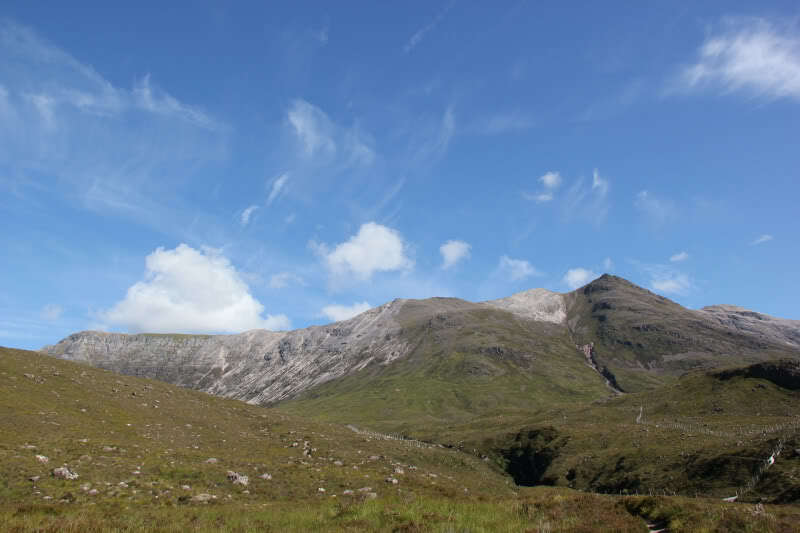 From the Beinn Eighe car park, opposite the Ling Hut, we set off along the good track leading initially between Liathach and Beinn Eighe and round towards Coire Mhic Fhearchair. 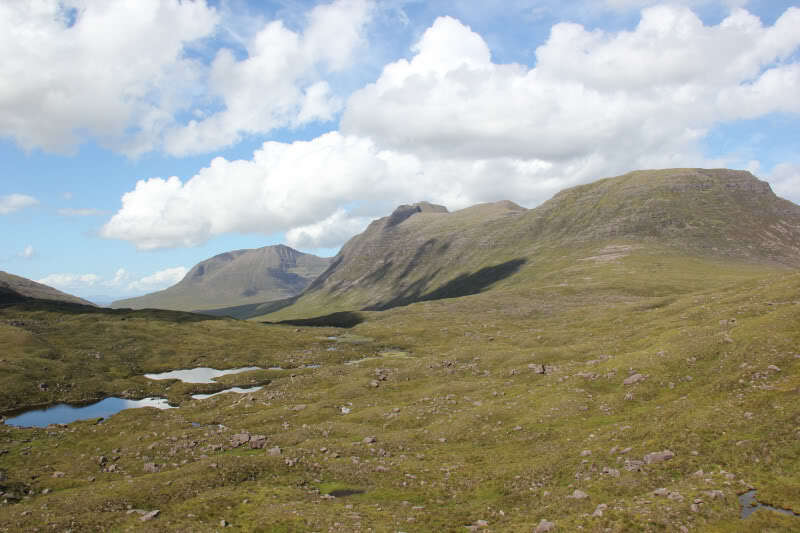 The weather was pretty-good from the outset. If anything, it was too hot! We initially made good progress along the track. After about an hour of walking, it was obvious that something wasn’t right. For about every ten minutes of walking, I was waiting five minutes for Steve to catch-up. 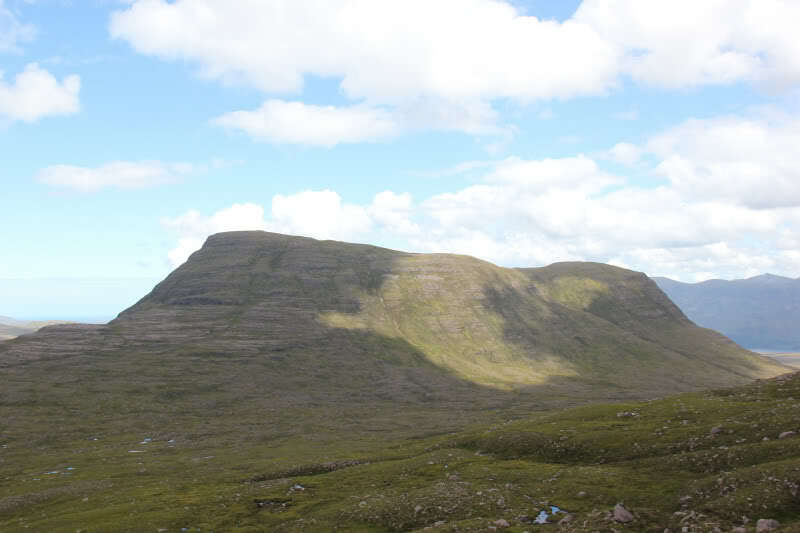 After about another hour, Steve admitted that he had hurt his leg and thought it best to head back. I agreed, as the pace had slowed to a near crawl and if we had continued at that pace we would be coming off in the dark. I continued on. 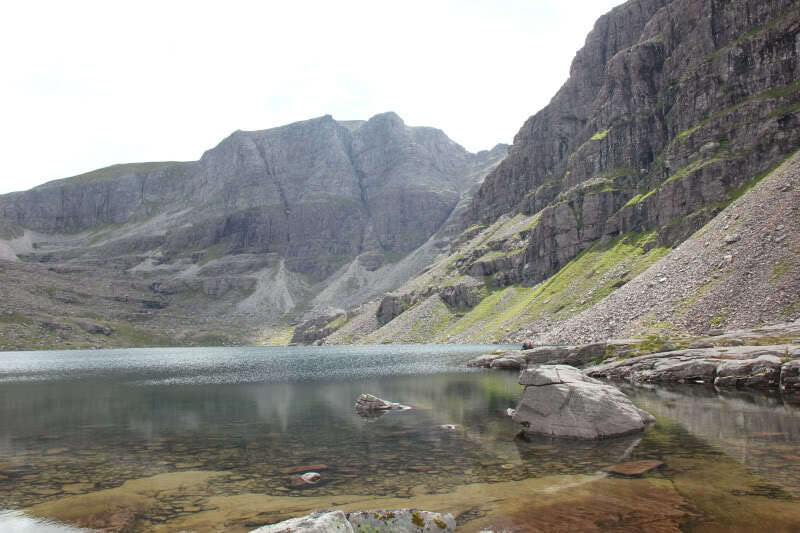 I wasn’t disappointed on reaching Coire Mhic Fhearchair - definitely one of the nicest coires in Scotland. 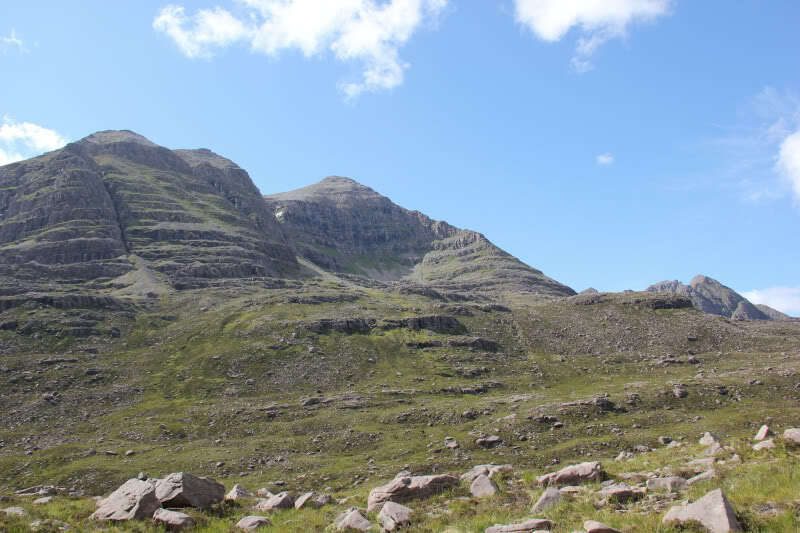 I think next time I do this hill, I will take a tent and camp up in this coire. 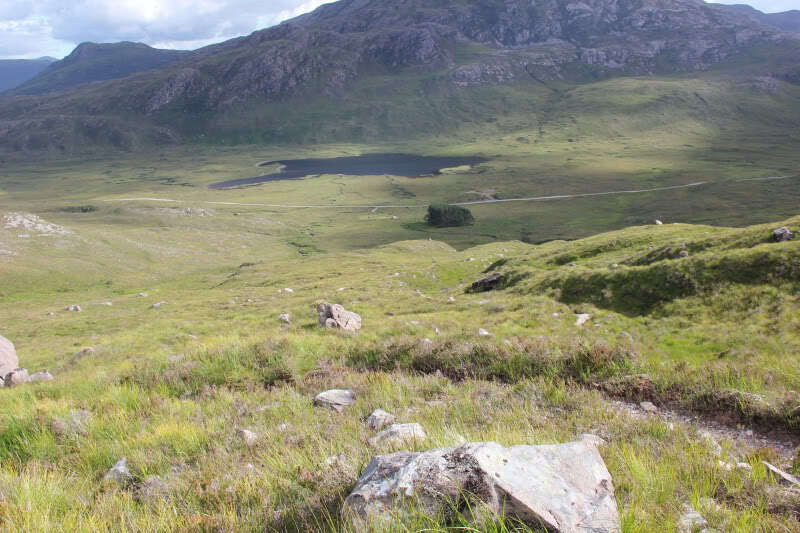 After crossing the outflow, I skirted round the loch and then followed the path leading up past the three small lochans to reach the foot of the eroded scree slope. 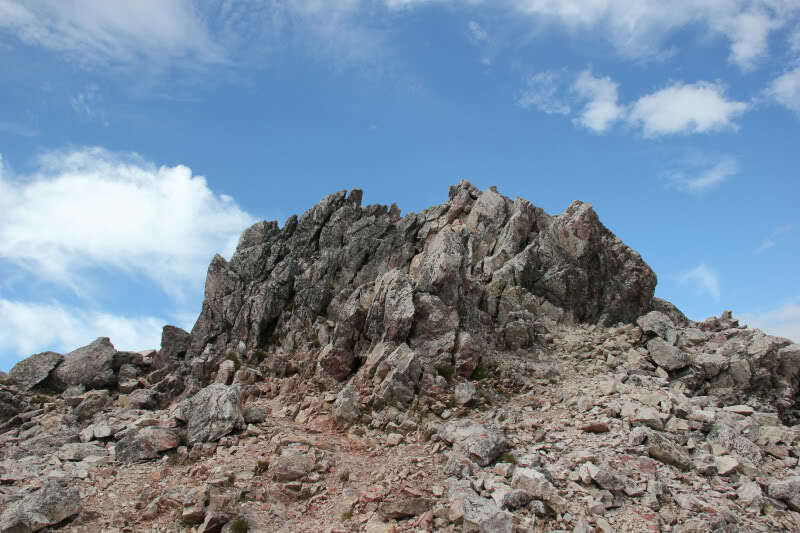 As I made my way up the scree, I was starting to feel the heat. 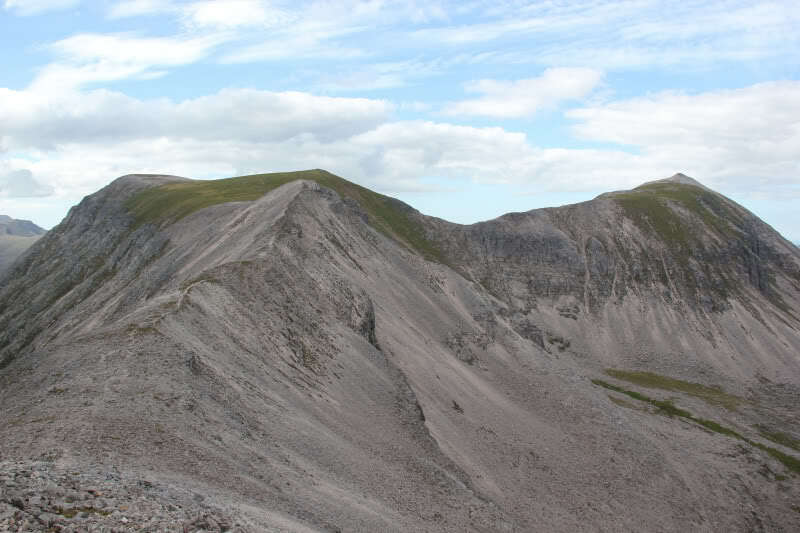 I went directly up the middle of the scree as I didn’t realise that there was a path bypassing most of it to the left. Two steps up, one slide back. 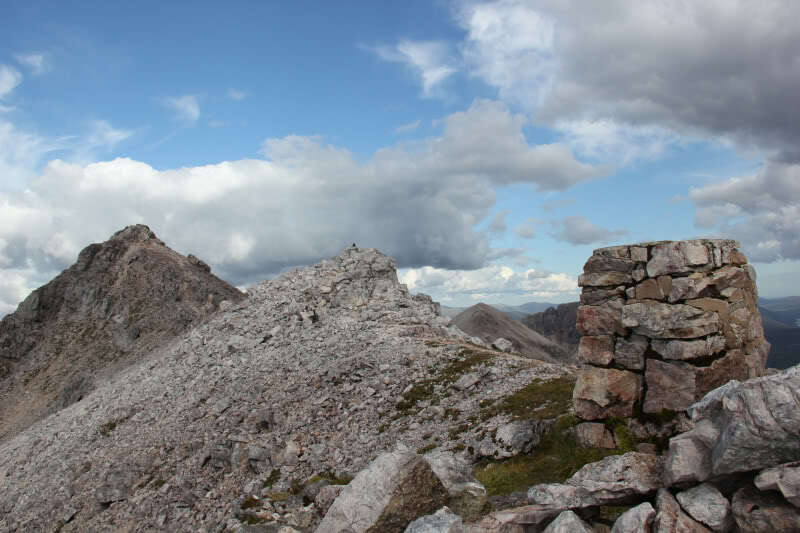 On reaching the rockier upper section, I ascended the quartzite rocks to the side, instead of the scree. 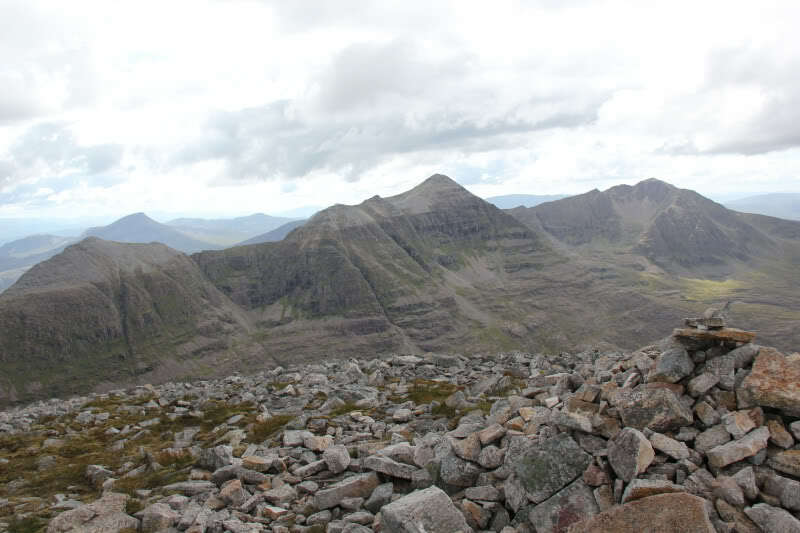 It was nice to get onto the ridge. 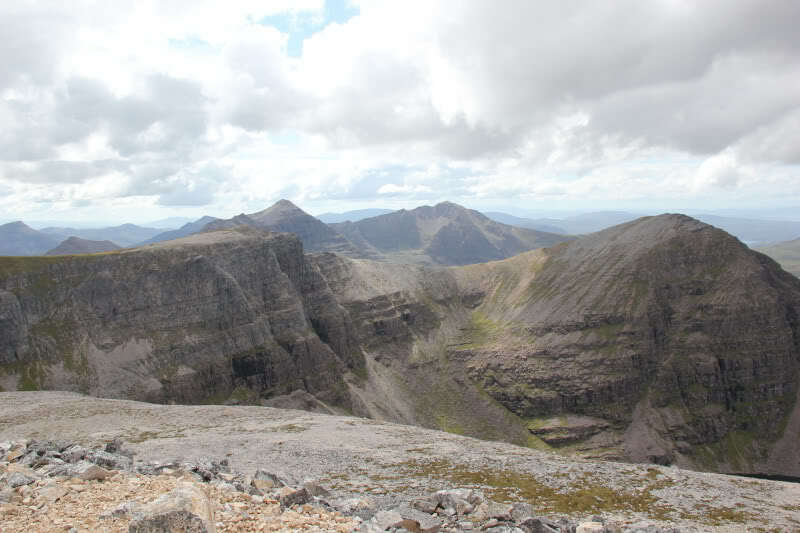 As I made my way along to Ruadh-stac Mor, I stopped for a brief chat with another walker. 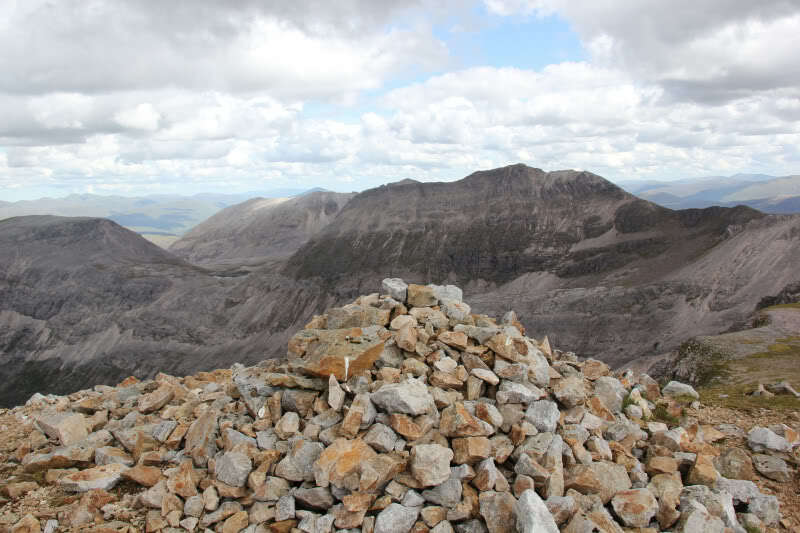 Good views from the summit of Ruadh-stac Mor. 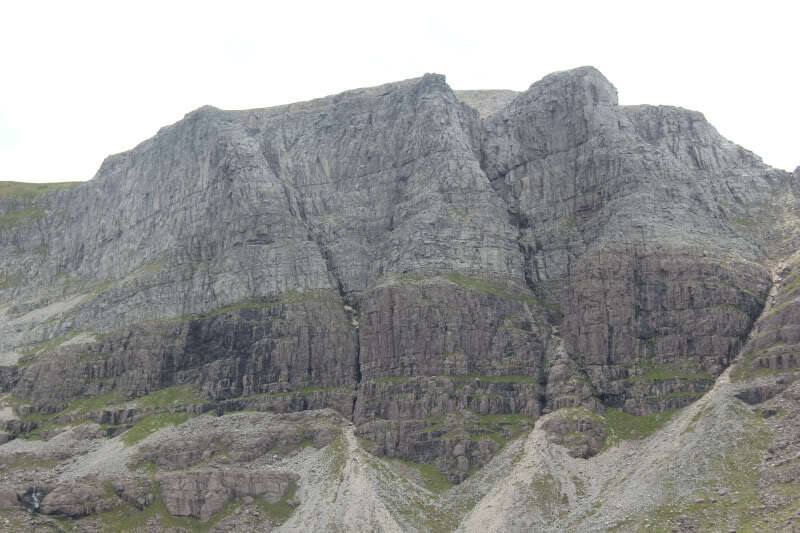 As I made my way back along the ridge, from the summit of Ruadh-stac Mor, I stopped to take a photo of the triple buttress. 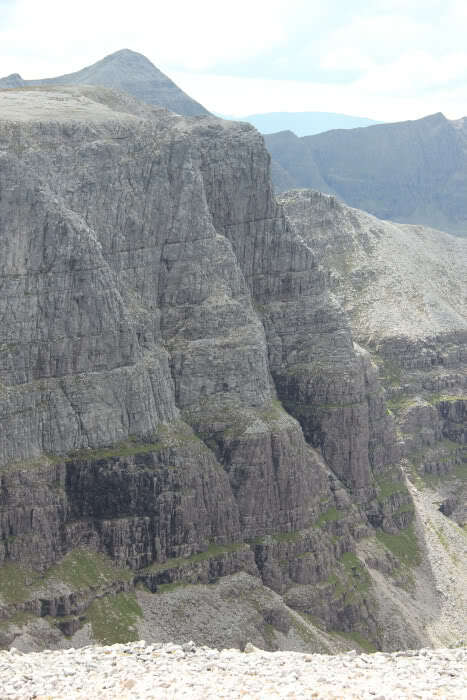 It was good to see it in profile, to get an idea of how steep it is. 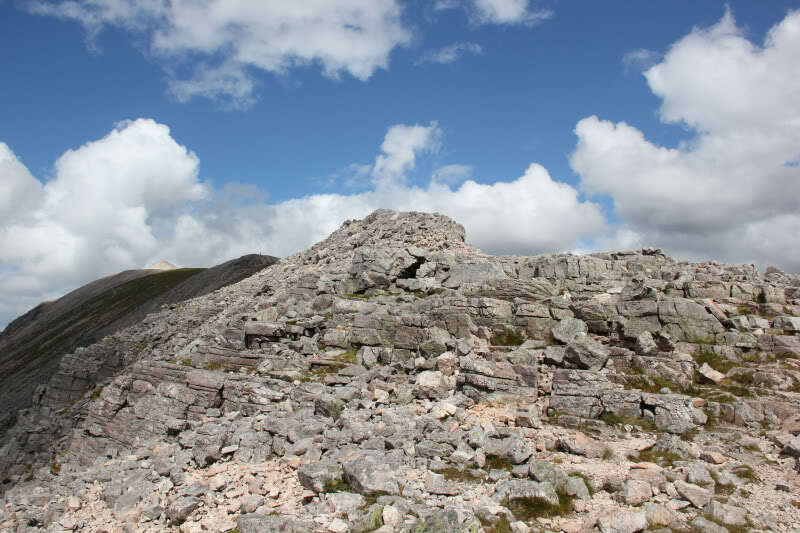 After passing the scree slope that I had used in ascent, I continued directly up some rocks towards Coinneach Mhor. 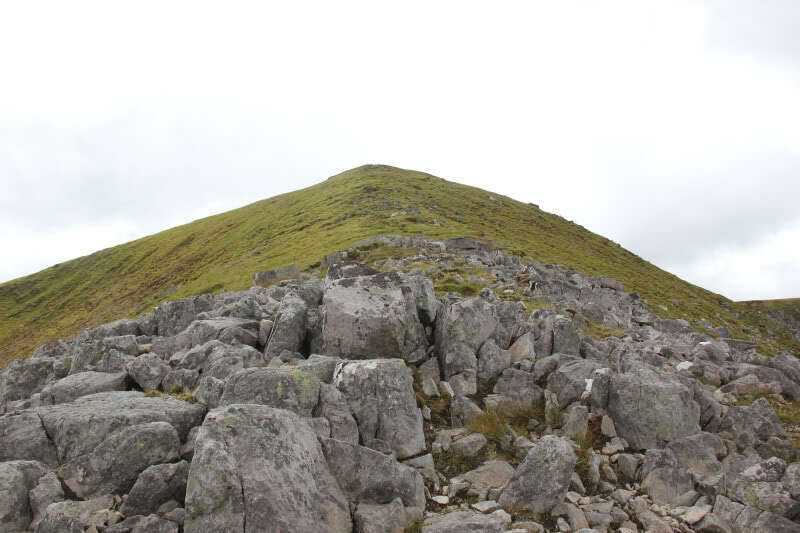 I initially visited the deleted Munro Top and then the current Munro Top. 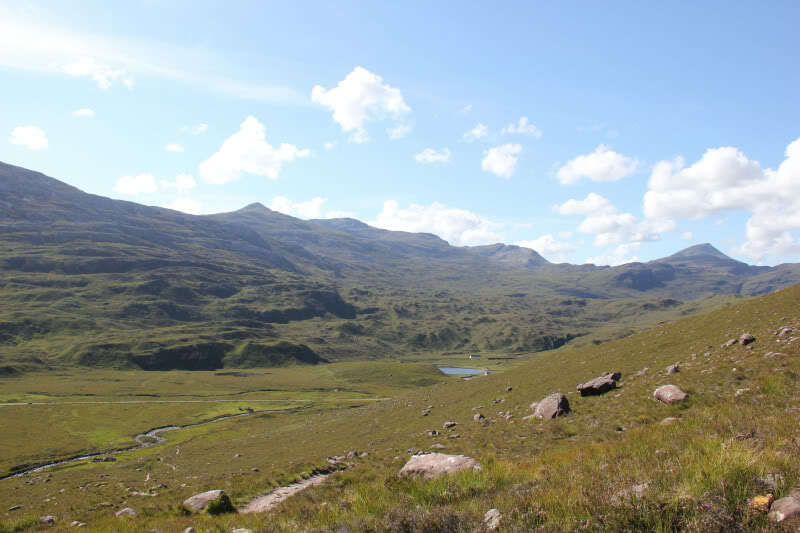 The walk out to Coinneach Mhor was across grass – a pleasant change from the rest of the walk. 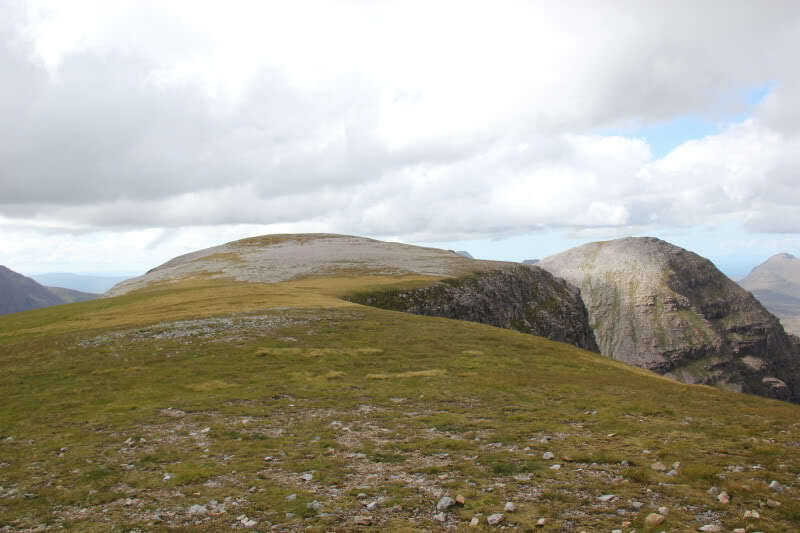 I had originally also wanted to ascend Sail Mhor but decided that it was a ‘top too far’ as I still had quite a bit to go to reach Spidean Coire nan Clach and it was already mid-afternoon. 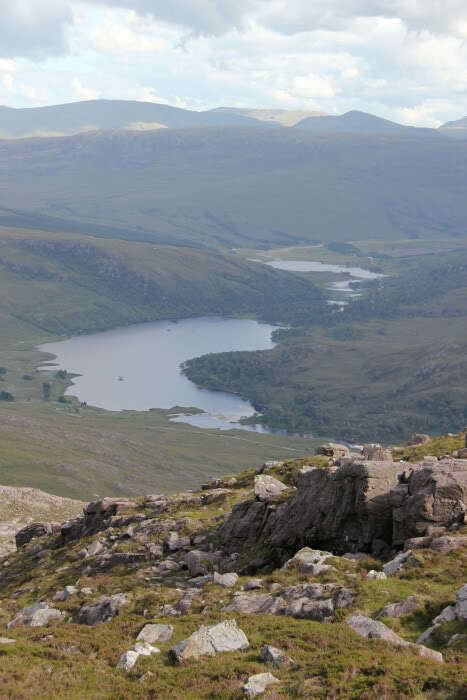 I’ll be back for Sail Mhor! 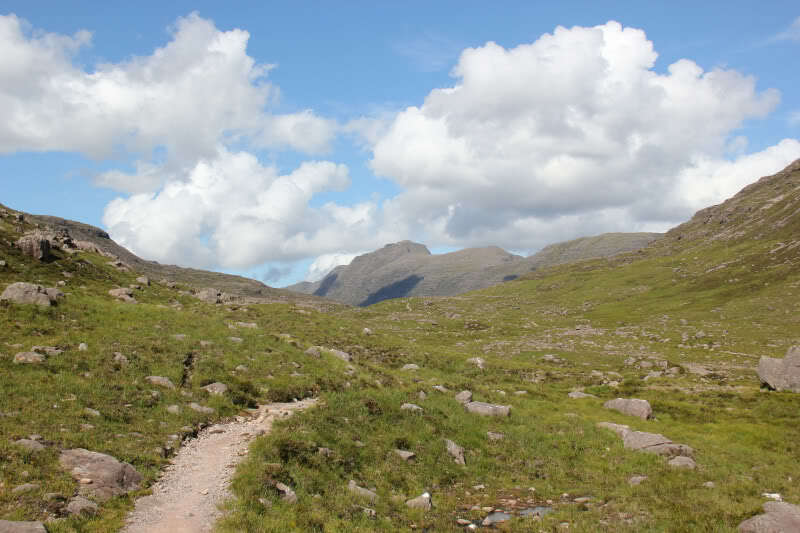 The walk along the ridge towards Spidean Coire nan Clach was quite pleasant. 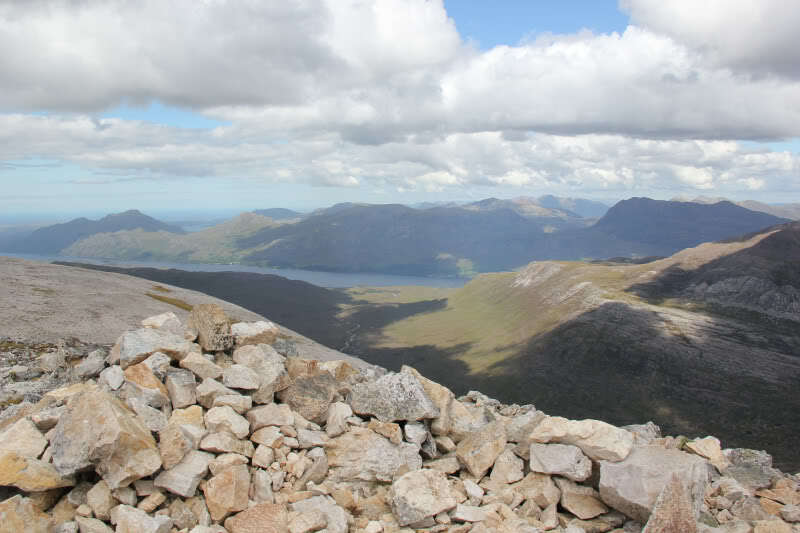 I got a bit of a surprise on reaching the trig point as I thought it was still a few hundred metres off. 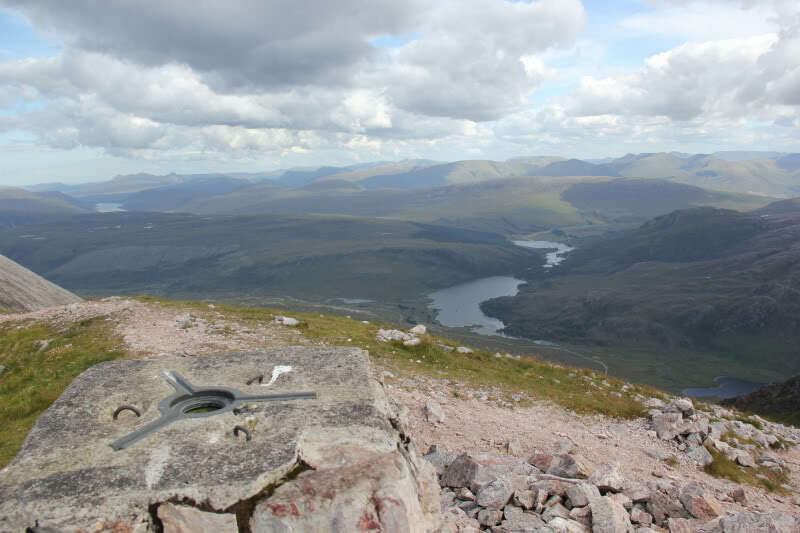 From the trig point, I continued on to the actual summit. 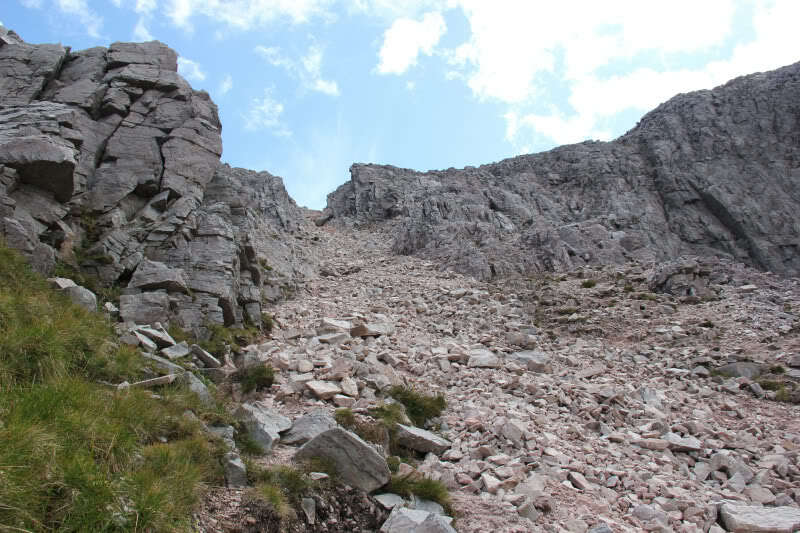 A wee bit of easy scrambling to reach the summit, which can be mostly avoided via slopes to the right. 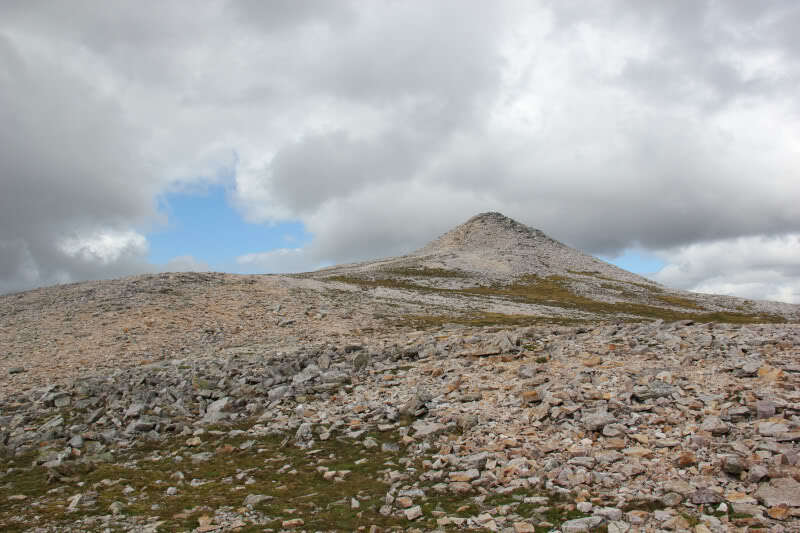 After a brief stop at the summit, I returned back to the trig point from where I followed the descent path back out to the road. 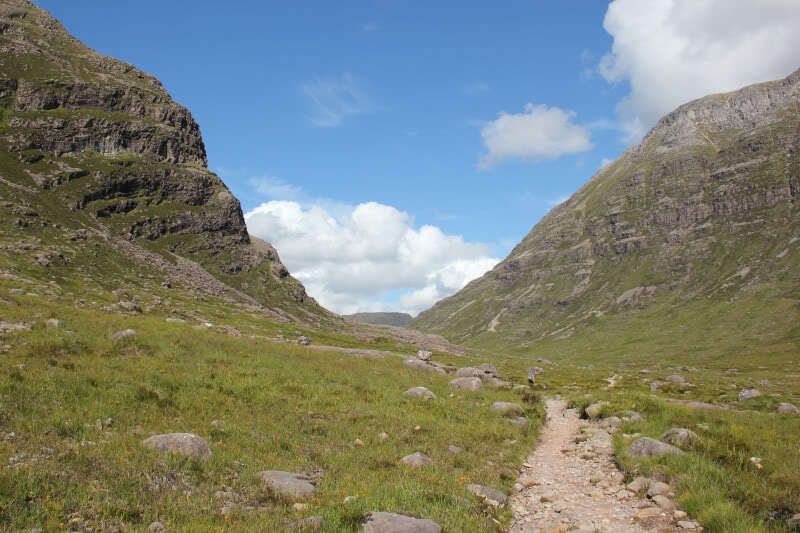 The initial descent is down a nice winding path. 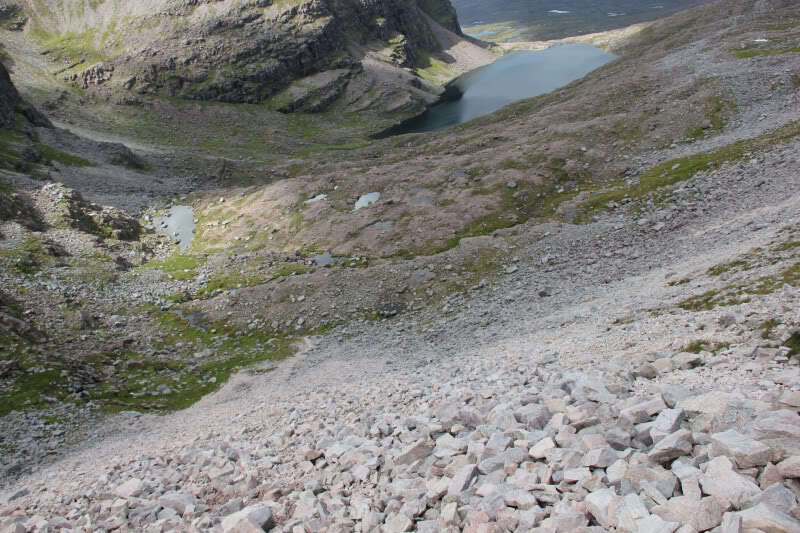 The next part of the descent is a bit pants – down a really eroded steep slope. 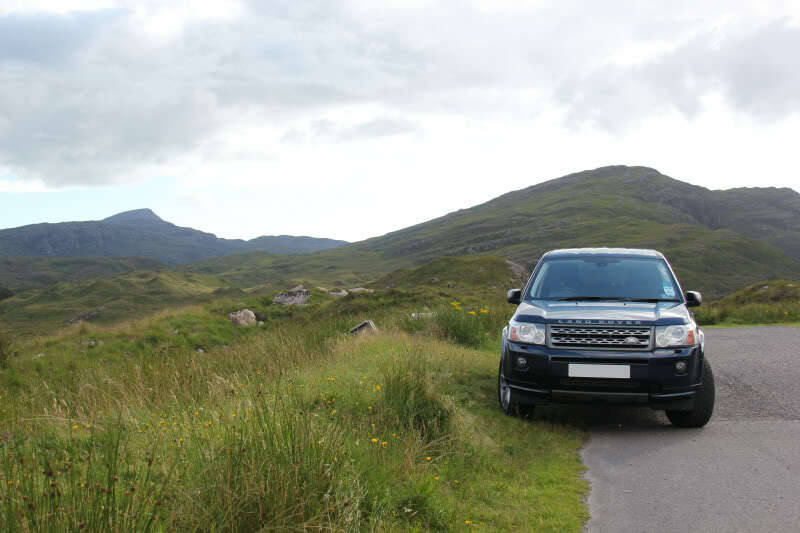 The subsequent part of the path is fairly good out to the road – as this part of the path has had lots of work done to it to prevent erosion. 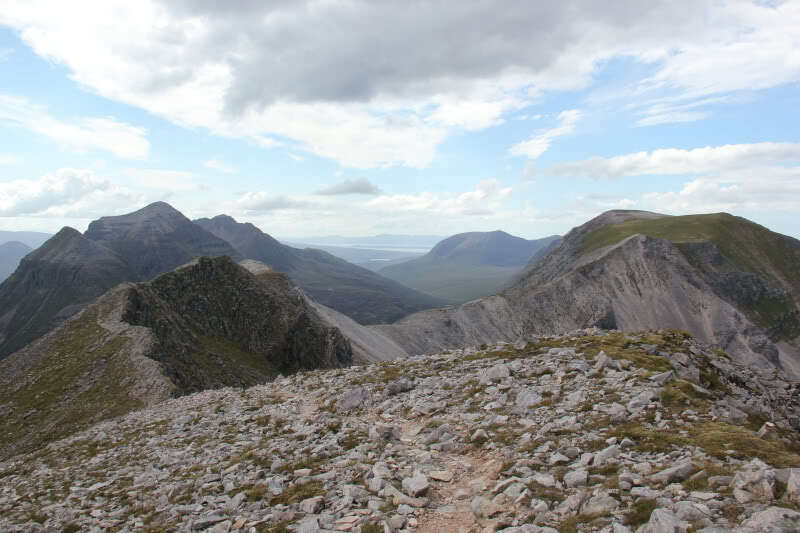 I found the descent fairly steep and tiring and was quite happy to reach the road and even more so to reach the car (after a couple of kilometres walk back along the road).